For the past four years, the Interra Project has developed an ingenious model for people to use financial networks to support their local communities and sustainability. Recently, Interra rolled out its first project -- Boston Community Change - in partnership with Boston Main Streets. Boston residents can get a free (at least for now) Boston Community Change card that they present to participating local merchants. Every time the card is swiped on the merchant’s credit card terminal, portions of the transaction are returned to the user as a cash rebate, donated to a local community based non-profit or school of the user’s choice, and donated to the local Main Streets organization. Merchants sign up for free, and decide how much of a rebate to grant to users. The Boston Community Change card is not a payment card, and users can pay for their purchase with any payment form accepted by the business. Users receive monthly electronic statements detailing total rebates and donations. As Paul Ray, author of the “The Cultural Creatives,” has said: "The Interra model is a brilliant social and financial invention that can help bring a green economy into greater practicality. This is hot stuff, and needs all our support. It functions rather like an alternative currency or an airline miles program, to help encourage mutual loyalty among green/socially responsible consumers. In particular, it does a better job of incentivizing a mutual loyalty of businesses and customers who share the same values." Interra has identified more than 100 cities for possible roll-out over the next 3-5 years. Fast food is often unhealthy, over-processed and its processing, packing and transportation create huge amounts of waste and CO2 emissions. A small but growing number of communities across the country have banned so-called "formula" restaurants. The New York Times reported September 24 that NYC Councilman Joel Rivera, Chairman of the Health Committee, wants to use New York zoning laws to limit the number of fast food restaurants in the City. New York City also became the first U.S. city to ban trans fats in restaurants. Celebrate Independents Week By Buying Locally and Helping the Environnment! The American Independent Business Alliance (AMIBA) is celebrating "Independents Week" by asking people to take the Indie Challenge by purchasing as much as possible from your community's independently-owned businesses July 1-7. AMIBA points out that buying locally keeps your money circulating in your community three times longer than buying at chains where most of it it leaves the community immediately. Buying locally also helps the environment by reducing supply chains (and corresponding transportation/green house gas emissions). "Locavores" -- a group that promotes eating locally -- publishes a list of "Top Twelve Reasons to Eat Locally" that includes freshness, taste, nutrition, purity, regional economic health, variety, soil stewardship, energy conservation, environmental protection, and cost. Participants in "Independents Week" include the American Booksellers Association, American Specialty Toy Retailing Association, Association for Enterprise Opportunity (AEO), Association of Retail Travel Agents, Coalition of Independent Music Stores, Council of Independent Restaurants of America, Institute for Local Self-Reliance/New Rules Project, National Grocers Association (NGA) and National Main Streets Center/National Trust for Historic Preservation. To register your community, go here. 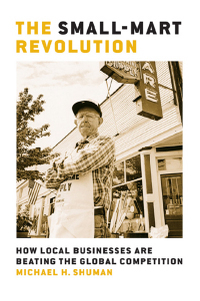 For more information on purchasing localy, see AMIBA's "The Benefits of Doing Business Locally." At the conference last week in Burlington, VT, for the Business Alliance for Local Living Economies, there was much talk about companies with a Triple Bottom Line. Profits, yes, but also people and planet. I wonder: what would it mean for our planet if businesses truly had a legally enforceable Triple Bottom Line? What if businesses were legally required, or agreed, to internalize all the costs that many now externalize? What if manufacturers incorporated the true life-cycle costs of their products (production and waste) as part of their business expenses? What if businesses valued their employees as much as they now do their shareholders? While it's unlikely -- at the moment, at least ;-) -- that government would legally require businesses to adopt a Triple Bottom Line, there is no legal reason why a business could not voluntarily create such a legally binding commitment in its articles of incorporation and bylaws. And what should society do for a corporation that puts people and planet on a par with profits? Given the tremendous saving that accrues to society from a business that internalizes its environmental and societal costs, I'd say the business should be given a whopping tax benefit including, at least, tax exempt (or extremely reduced) status for profits, distributions and employee incomes. To quote Gary Snyder: "We are defending our own space, and we are trying to protect the commons. More than the logic of self-interest inspires this: a true and selfless love of the land is the source of the undaunted spirit of my neighbours." 1) A California appeals court upheld (against a challenge by Walmart) a local ordinance that banned supercenters on the grounds that the ordinance was reasonably related the city's efforts to maintain stores throughout the community to support neighborhoods, and to avoid excessive driving and air pollution. (Anti-Supercenter Ordinance Upheld). 2) A Montana County unanimously adopted a 60,000-square-foot size store cap following a public hearing (Crowd of 1,400 Turns Out as Montana County Bans Big Boxes). 3) A Maine town adopted a 35,000 sq. ft. limit in an election that may have been the largest turn-out in the town's history, and three nearby towns are considering similar legislation (Damariscotta, Maine, Rejects Wal-Mart and Endorses Size Cap). The ordinance was enacted in spite of a study, issued two weeks before the election, that was comissioned by the town and paid for by Wal-Mart, and concluded that the supercenter would be a boon to the local economy and would raise wages in both the retail and non-retail sectors. The citizens group supporting the ordiance quickly issued two rebuttals to the study, one produced by the Institute for Local Self-Reliance.